On Saturday 3 June, the weather is forecast to be sunny. 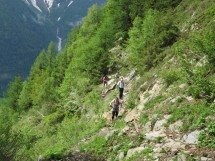 I organize a hike from Les Houches (75 km from Geneva). The pinnacle of Houches is a real balcony with a panoramic view of Mont Blanc du Tacul, the Dome Taste, Mont Maudit, the Bionnassay glacier and needles. The rise is in turn in different environments: forest initially and pastures and finally a passage without difficulty or danger edges. It also offers views of the valley of Les Houches and Mont Blanc. A gradient of 850 m and a distance of 10 km. Walking time: about 5 hours.